I realize what was happening, I was showing my son what being a sports fan is all about. You may not be able to see it in my face. In fact you might not even be able to tell at all that I am upset. You see, I am a Kansas Jayhawks fan. I bleed crimson and blue. In the Third Round of the NCAA Tourney (it’s still strange to say Second and Third round for what was the First and Second around growing up) the Jayhawks, choked. They choked, there really isn’t much more that I can say about the loss that KU had to Stanford. I was frustrated. I was mad. You couldn’t tell by my face though because being a dad has made me a better sports fan. This is despite writing recently about how being a parent has made me more competitive. I was one that would yell and scream at the TV during games. It didn’t matter what sport, I have a team that I root for and to me they should win every game. I would yell when KU wouldn’t make a 3-pointer and I would scream when Sporting KC would miss a critical late game shot. I would throw my arms up in frustration when the Colorado Rockies would give up a run in the bottom of the ninth to lose the baseball game. This was very early in my young adult life. This trend continued well into my life as a husband. I digress though. During the 2012 tourney, I realized just how much of an influence I was going to be on my son. He was going to watch my every move and more than likely grow up to be a lot like me. That probably means that he will be the sort of sports fan that I am. 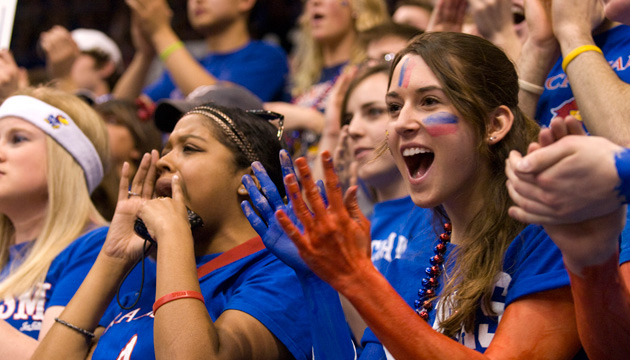 As KU lost the championship game to Kentucky, I was furious. My son who could barely sit up at the time, was watching me from the floor though, probably wonder who this crazy person was that was getting mad at the TV, I bet even he could tell that the people in that black box could not hear me. In 2013, not much changed. I continued to get mad, yell, and cheer loudly at the TV. It wasn’t until I caught my son doing the same thing that I realized something needed to change. The 2014 tourney rolls around, and lots of factors could have played a roll into my reaction to the tournament. I didn’t have much confidence in the Kansas Jayhawks going into the tournament. In fact I wasn’t able to watch much of the games due to us not having cable and the fact that ESPN black-outs the games online. Things are looking up and my confidence is building in the team as they win in the Second round and go to face a much lower seeded Stanford team. I sit down to watch the game and I quickly realized that this game was going to be a frustrating one. It was close the entire way, but there was something going on with me that I didn’t realize until the second half of the game. I wasn’t yelling, getting mad, nor was I frustrated. I realize what was happening, I was showing my son what being a sports fan is all about. He could see my passion for the Jayhawks, he could tell that during the games, it probably wasn’t the best time to ask me if he could watch a movie. Another thing he could see was that even though we lost the game, it doesn’t mean that it is the end of the world. I can’t say that I will stay this way. I am sure that I will eventually slip up here and there and get so mad that I want to throw a shoe at the TV. But what I can do is keep pushing my son to be passionate about something; whether that is sports, music, writing, or math be passionate about it. My actions need to show him that even if things aren’t going your way life will go on. ← Are We Competitive As Parents? Why Didn't Someone Tell Me I Wouldn't Be Getting Paid for This?